Consumers aren’t actually impressed by just a "Hi!" And as deluged by content as they are, they know they have the luxury of simply ignoring you. To catch their interest, you need to demonstrate that you know what they want, and you can deliver it. 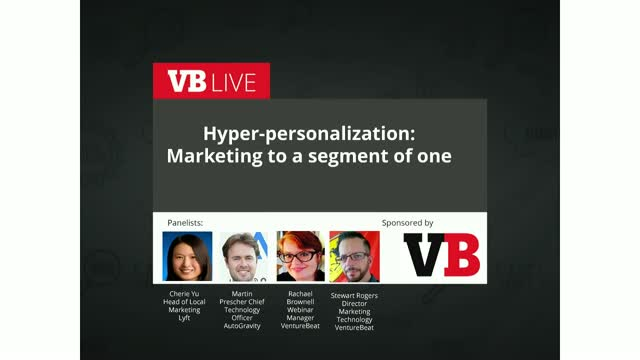 In other words, hyper-personalization. Innovations in marketing tech, like AI, machine learning, and shopping bots, enable you to microsegment all the way down to a customer’s purchase and interest patterns to develop messaging that triggers powerful interest, creates deep engagement, and drives sales. Learn more about the tech you need, the strategies that win, and how to deliver the “you know me” satisfaction that keeps customers coming back for more when you join this VB Live event!